Omdurman (standard Arabic Umm Durmān أم درمان) is the largest city in Sudan and Khartoum State, lying on the western banks of the River Nile, opposite the capital, Khartoum. 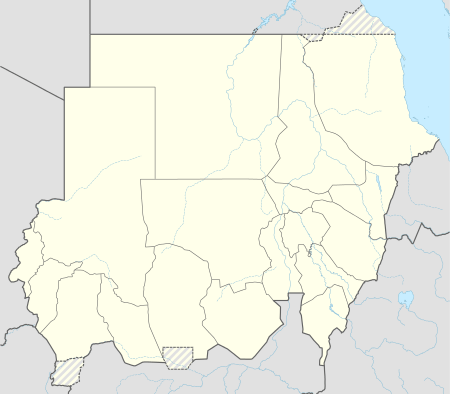 Omdurman has a population of 2,395,159 (2008) and is the national centre of commerce. With Khartoum and Khartoum North or Bahri, it forms the cultural and industrial heart of the nation. The name Omdurman (Umm Durmān) literally translates as "Mother of Durmān", but who she was or might have been is not known. There are unattested legends of a woman known as Umm Durmān who lived in an area at the confluence of the White and Blue Niles, but her importance remains obscure. In 1884, Muḥammad Aḥmad, "the Mahdi", made his military headquarters in the village of Omdurman. The conflicts that followed over the next fifteen years have become known as the Mahdist War. Following the defeat of the besieged defenders of Khartoum in 1885, the Mahdi's successor, Khalifa ʻAbdullahi ibn Muḥammad, made Omdurman his capital. 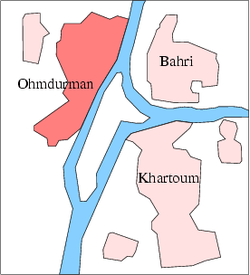 A map of Omdurman with Khartoum and Bahri. The city, now the location of the tomb of the Mahdi, grew rapidly. However, in the Battle of Omdurman in 1898 (which actually took place in the nearby village of Kerreri), Lord Kitchener decisively defeated the Mahdist forces and killed the Khalifa, ensuring British control over the Sudan. In September 1898 the British army of twenty thousand of well drilled men equipped with the latest arms, Maxim guns and Martini-Henry rifles under the command of General Herbert Horatio Kitchener invaded Sudan. In the battle Omdurman, the British army faced Sudanese defenders consisting of over 52,000 poorly armed desert tribesmen dervishes . In space of five hours the battle was over. The Sudanese defenders suffered over 93 percent casualty with at least 10,000 killed. By contrast there were fewer than four hundred casualties on the British side with forty eight British soldiers lost their life. Then, General Kitchener proceeded to order the destruction of the Mahdi's tomb and in Churchill's words " carried off the Mahdi's head in a kerosene can as a trophy". Kitchener restored Khartoum as the capital and, from 1899 until 1956 Sudan was jointly governed by Great Britain and Egypt. Although most of the city was destroyed in the battle, the Mahdi's tomb was restored and refurbished. On 10 May 2008 the Darfur rebel group of the Justice and Equality Movement moved into the city where they engaged in heavy fighting with Sudanese government forces. Their goal was to topple Omar Hassan al-Bashir's government. Omdurman features a hot desert climate, with only the months of July and August seeing significant precipitation. Khartoum averages a little over 155 millimetres (6.1 in) of precipitation per year. Based on annual mean temperatures, Omdurman is one of the hottest major cities in the world. Temperatures may exceed 53 °C (127 °F) in mid-summer. Its average annual high temperature is 37.1 °C (99 °F), with six months of the year seeing an average monthly high temperature of at least 38 °C (100 °F). Furthermore, throughout the year, none of its monthly average high temperatures falls below 30 °C (86 °F). This is something not seen in other major cities with hot desert climates such as Riyadh or Baghdad. Temperatures slightly cool off during the night for only 3 months during the year, with Khartoum's lowest average low temperature of the year just above 15 °C (59 °F). The city literally does not experience seasons, just like most parts of the Arabian peninsula and north-eastern Africa where it's either hot or very hot all year long. 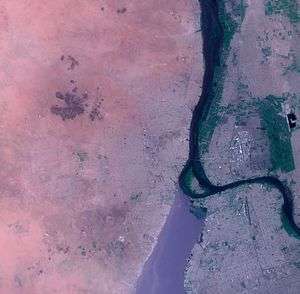 Omduran is on the western side of the Nile river, opposite Khartoum. Depicted as an icon for nationalism and diversity, Omdurman has been featured in numerous poems and songs. As the unofficial national cultural capital of Sudan, the word "national" is tied to many of the city attractions. Some of Omdurman's famous arts facilities include the National Theatre, Al-Arays (Puppets) Theatre, Alwataniya Cinema, Sudan TV and radio station studios, The Higher Institute for Music and Theatre and Qasr Alshabab o Alatfal (Youth & Kids Palace). Every Friday evening at Sheikh Hamad-al Nil Tomb in Omdurman one can see the Whirling Dervishes. The whirling Dervishes are heterodox Sufi Muslims who wear colourful patchwork robes and dance to the beat of drums, twirling and stamping their feet until they go into a trance. They consider this dance a ritual from Islam's earliest days, though it is generally considered in Sudan and abroad as a peculiar local folklore. At the height of the dance, participants say that their souls communicate with Allah (i.e. God, in Arabic) and are cleansed of evil. The spell is only broken with the call to evening prayer. Leila Aboulela, a Sudanese author born in Khartoum, portrays daily life in Omdurman. Her novels are Minaret, The Translator (1999), and Lyrics Alley (2010). Lyrics Alley is set in Omdurman in the 1950s near the end of major British influence in Sudan, leading up to Sudanese independence from Egypt. The story is inspired by the life of poet Hassan Awad Aboulela, the author's uncle. The Translator interestingly compares life in Scotland and Khartoum. These books give a memorable introduction to changing cultural practices and historic changes experienced by characters living in urban Sudan between 1950 and 2010. They also illuminate the characters' relationship to Islam. Furthermore, there are several public libraries in Omdurman. Albashir Alrayah Library is a famous library and hot destination for students, researchers and intellectuals. The library hosts several lectures and panels from different guest speakers and organizations. Omdurman has several multicultural tourist targets and facilities that attract local and international visitors. Souq is the Arabic term for a market. Souq Omdurman, Souq Libya and Souq Aljilod are considered the largest merchandise spots that make up the scenery at Alshohada. Within this busy and noisy environment, there lies two hospitals: Omdurman Hospital and Blue Nile Hospital with several pharmacies at walking distances. Another important destination in Omdurman is Almourada. Famous for its fish market along the banks of the Nile, Almourada is one of the old historical neighbourhoods in Omdurman. Fishermen and local merchants post at the shores selling their fresh catch. It is also home of Al-Mourada football club, named after the neighbourhood, a top Sudan Premier League team that has represented Sudan on numerous CAF, and other regional tournaments. Another shopping area is Alshohada or Hay Alsouq, Omdurman's downtown area, known for its transportation lines, buses, taxis, canteens, barbershops, fast-food restaurants, music stores and for Sudanese commodities and gadgets. Another important speciality trading area is Abu Rouf. Known for its small-scale crafts including metallic beds, boat-making and extracting wood. Located along the shores of the Nile, swimming is considered an eternal hobby of Abu Rouf residents. Souq El Naaga (Camel Market) is a typical pastoral market, located southwest of Omdurman centre, cattle sales are held at the market, where it also offers various basic necessities for pastorals. The major attraction of the Souq is its stalls of freshly slaughtered meat and traditional food sheds where roasted and stewed meat is served. Camel meat, and its spiced uncooked liver are considered delicious delicacies to many Sudanese. West of Omdurman - just outside Omdurman there is a camel market- Souq Abu Zayd, where merchants come to buy and sell their desert animals. This is one of the main trading centers of camels in Sudan. Camels offered in this market are brought in mainly from western Sudan and subsequently are usually herded overland to markets in Lower Egypt. The white or paler coloured camels are the more desired and therefore highly prized, and many of the camels wear leather kitabs, talismatic pouches containing prayers to protect to the animals on their long walk to the souq. Omdurman city has its own industrial area, in which many of huge factories are working under the control of Sudanese government, in terms of production control and quality assurance. There are several outdoor activities and destinations that are worth visiting in Omdurman. This include Almourada Family Park, on the opposite side of Souq Almourada. Rivera Recreational is another modern park along the shores of the Nile that features outdoor dining and children playing facilities. The recreational facility has a large rental ballroom that is available for the public for hosting events such as weddings. The tomb of Sheikh Hamad El Nil, a 19th century Sufi leader of a Qudiriyah order. 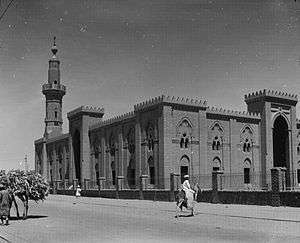 The tomb and the adjoining mosque are located on the western side of Omdurman. The followers of Quadriya Sufi sect gather on Friday afternoons for Zikr. The congregations usually attract large crowds of local people and tourists. The Mahdi's Tomb in Omdurman. The Tomb of the Mahdi was erected after Mahdi's death, in 1886-1887. It was demolished by the British after the Battle of Omdurman in 1889. The tomb was restored in 1947. The Khalifa House (Arabic: Beit al-Khalifa) Museum was built as a residence for Khalifa Abdallahi ibn Muhammad in 1887-1891. Now opened to a public as the museum of Mahdiya. Remains of the fortifications from the Mahdiya period. 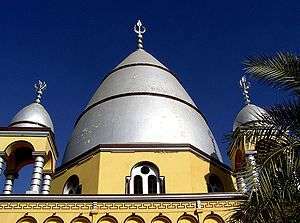 The Nile Mosque located near the confluence of Niles. Omdurman Teaching Hospital, the biggest public hospital with an emergency center. With Sudan's best three football clubs based in Omdurman, the city is considered the epicenter of football in Sudan. Al-Hilal, Al-Merreikh and Al-Mourada football clubs constitute the triplet of Sudanese football. Other sports played include basketball, with Coptic School Omdurman Club being one team that plays the sport. When historic rivals Alhilal and Almerrikh play against each other, precautions and advisory announcements are posted. On game days, police forces circle the pitch, local companies compete to support the teams, fans play musical instruments, burn newspapers, and honk horns. Early fan arrivals are recommended. Alhilal and Almerrikh games are one of the biggest and most watched events in the Sudan and one of the fiercest rivalries in Africa. Some of Omdurman's football stadiums include: Al Merreikh Stadium, AlHilal Stadium, Almourada Stadium, Stade de Omdurman and Dar Alrayada. Omdurman features the buildings and studios of the national TV and radio stations. "Hona Omdurman" (This is Omdurman) is the name of Sudan's national radio station. Other local radio stations include Taybah 103 FM, AlKawthar, Mango 96, 100 FM, FM 104 (sport), FM 94 and radio Holy Quran stations. There are 13 TV stations in Sudan: Sudan TV which is the national station and Blue Nile Channel, a private channel that is part of Arab Radio and TV network package, Alshorooq TV, Goon TV (sports), Omdurman TV, Elneelin Sport, Sanabil (children), Sahoor, Red Sea State channel, and Taybah TV. Out of the 13 TV stations three stopped broadcasting: Al Amal TV, Harmony TV, Zoal TV. 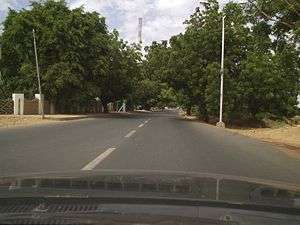 Several bus routes operate in Khartoum state. From Khartoum city to Omdurman, the main lines include Alshohada, Atthoura (passes through Alshohada) and Alfitihab. Minivans, Amjaads (four-wheeled microvans), taxis and raksha(s) (autorickshaw) are common transport methods. According to Sudanese officials, a new airport facility has been proposed 30 miles (50 km) south of Omdurman. Arguably speaking to be within the non-defined boundaries of Omdurman, the project was estimated to be completed by 2012 with an estimated budget of $530 million. ↑ Robert S. Kramer; Richard A. Lobban Jr.; Carolyn Fluehr-Lobban (2013). Historical Dictionary of the Sudan. Plymouth, UK: Scarecrow Press. p. 338. ISBN 978-0-8108-7940-9. ↑ Ferguson, Niall (2003). EMPIRE, How Britain Made the Modern World. London England: Penguin Books. pp. 267–272. ISBN 978-0-141-00754-0. ↑ "World Weather Information Service – Omdurman". UN. Retrieved 2010-05-06. ↑ "Average Conditions Omdurman, Sudan". BBC Weather. Retrieved 21 August 2009. ↑ "Sudanese higher education". Ministry of Higher Education & Scientific Research. Retrieved 2011-09-15. ↑ "Universities of Sudan". Consejo Superior de Investigaciones Científicas. Retrieved 2011-09-15.